Carrier Signs Has Been Serving The Business Community Since 1983. As a Small Company Carrier Signs Pays Close Attention To Detail & Customer Satisfaction. 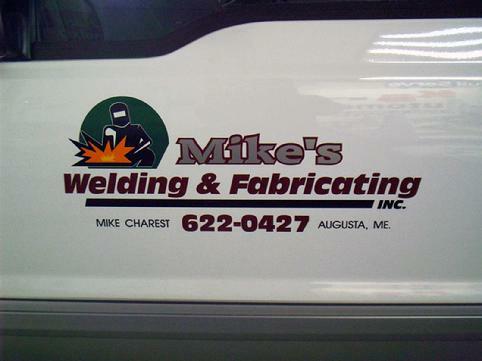 At Carrier Signs It's a Personal Contact, One on One, You Deal With The Owner & Subs Who Do The Actual Work. Please Take Some Time To Look Around, Carrier Signs Has Been Involved In Many Types Of Projects From Lettering Mailboxes, Installations, Designing Logo's, Fleet Lettering, Permits, Surveys, Internally Lit Signs, Pylon Signs, Free Standing Signs, Metal & Plastic Molded Letters, National Accounts Such As The Gap, Old Navy, Eddie Bower, Citifinancial to name a few. Thank You and Visit Often! Cube vans are a traveling billboard with thousands of viewers each week. PEP Transportation of Gardiner Me. is a division of EJP. Silver and Charcoal make a professional statement. PICTURED HERE IS A HEAVY WEIGHT BANNER. USED OVER MANY TIMES EFFECTIVELY. TODAYS BANNER MATERIALS ARE AVAILABLE IN MANY STYLES. SO ARE THE WAYS BANNERS CAN BE DISPLAYED. BANNERS MAY BE USED, PLEASE CONTACT CARRIER SIGNS. Custom stripes as shown were made inhouse. For more information contact Carrier Signs below and we will get back to you ASAP. Thank You.